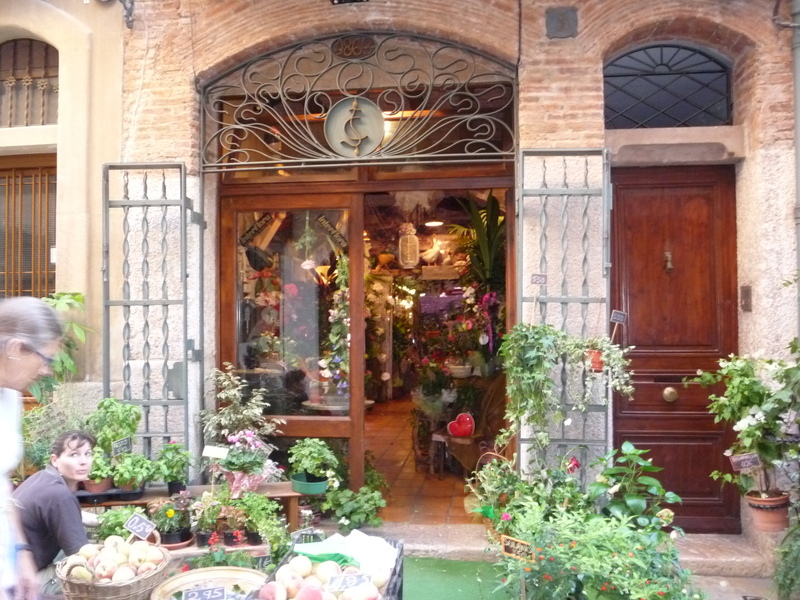 Our destination for the day would be the nearby city of Reus. Reus is the capitol of the comarca of Baix Camp (like a county seat) in the province of Tarragona. It used to be an important textiles and liquor city, and our hosts said something about it also having been the location for the Spanish stock exchange at some point. 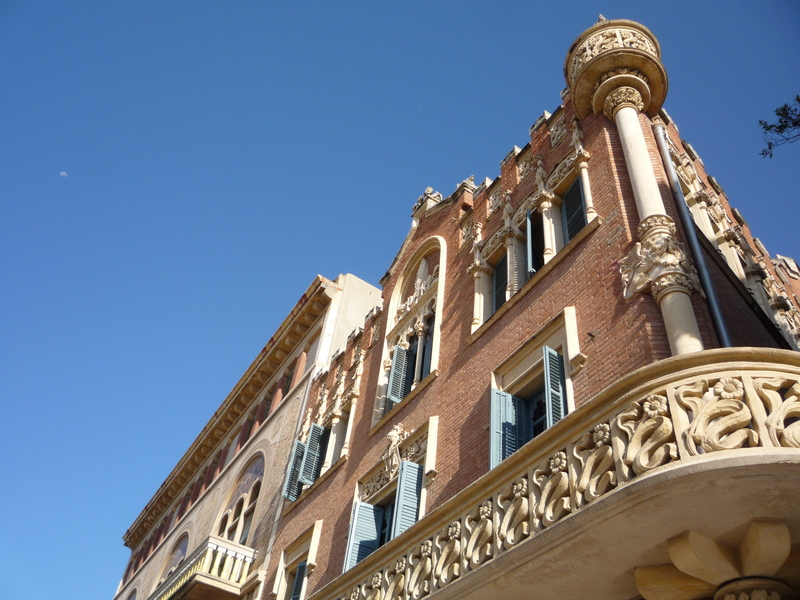 Reus is the birthplace of famed Catalán modernist architect Antoni Gaudí, and it currently has around 108,000 inhabitants. We finished breakfast and headed out: ¡Para Reus! Our first impression was the astoundingly-logical system set up in the parking lot below the market. 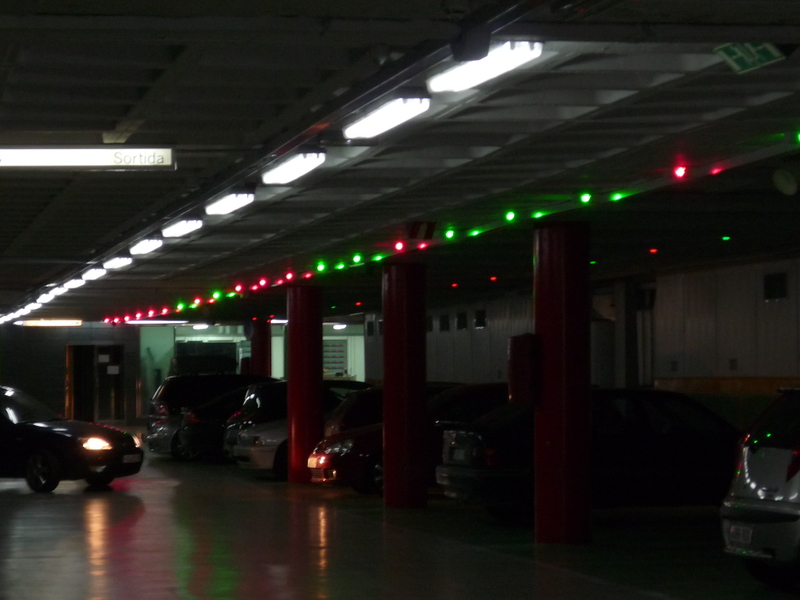 Once you pull into a spot, a light above your parking stall changes from green to red. This allows you to tell if there are any free spots or not before you actually turn into that area of the garage – super-smart time saver! 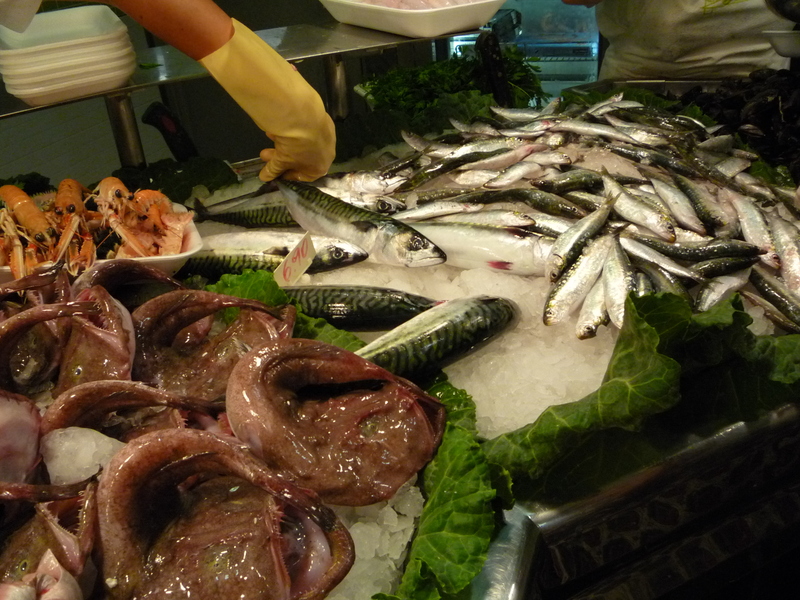 Our first stop was the fresh market, or Mercat Central. Alicia wanted to do some shopping, select and pay for her goodies, and then return to retrieve them before the shops closed up for lunch. In the car on the way to Reus, we students had decided to prepare for the evening meal a “paella mixta” (mixed-meat paella, which is a kind of rice dish, with pork, chicken, and seafood) instead of Alicia’s more Catalán-flavored favorite, “paella de conejo” (rabbit paella). As such, I was dreading the market experience. 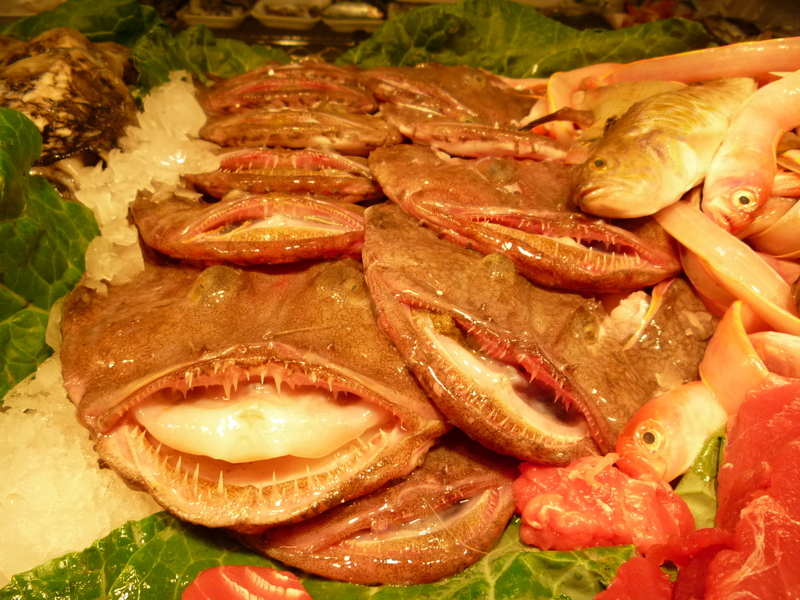 I had shopped on several occasions in these kinds of fresh markets when I was a student in Mexico, and those experiences were generally off-putting, and in some cases, even traumatic. Knowing we’d be adding pork ribs from the Reus market to our paella conjured up graphic memories of a filthy, open-bed pickup truck full of bloody pig carcasses which skittered slickly from one side of the truck bed to the other as the truck careened around the corner towards the Mexican market. Knowing we’d be adding chicken from the Reus market made me recall what my friend and I referred to less-than-affectionately as “the chicken gauntlet” – an entire long corridor of dead chickens hanging from the ceiling in the inner depths of the fresh market in our town in Mexico, near the public bathrooms. These chickens were somewhat gruesome in the freshness of their slaughter, to be sure, but the reason we loathed being anywhere near the chicken gauntlet was principally because it was the stinkiest place in the entire market. Something about a hall full of hanging chickens emanated the foulest odor (or should it be “the fowlest odor?” Har, har!) we’d ever smelled, and as we approached the market in Reus, I was not the least bit interested in the romantic-sounding nostalgia of repeating my glory days as a student in another country. Needless to say, I shouldn’t have worried at all! 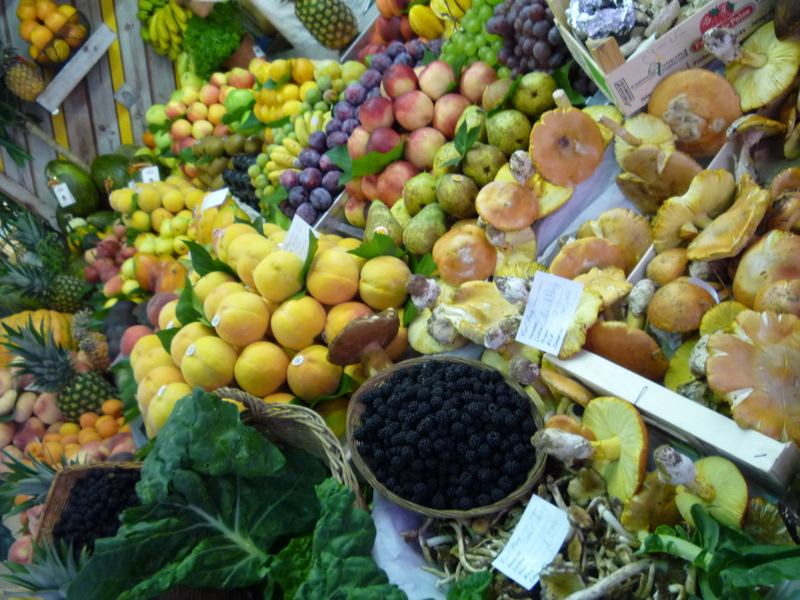 The market in Reus was nearly a religious experience. It was well-lit. It had actual floors, and not only that, they were so clean you could eat off of them. The corridors were wide and breezy. 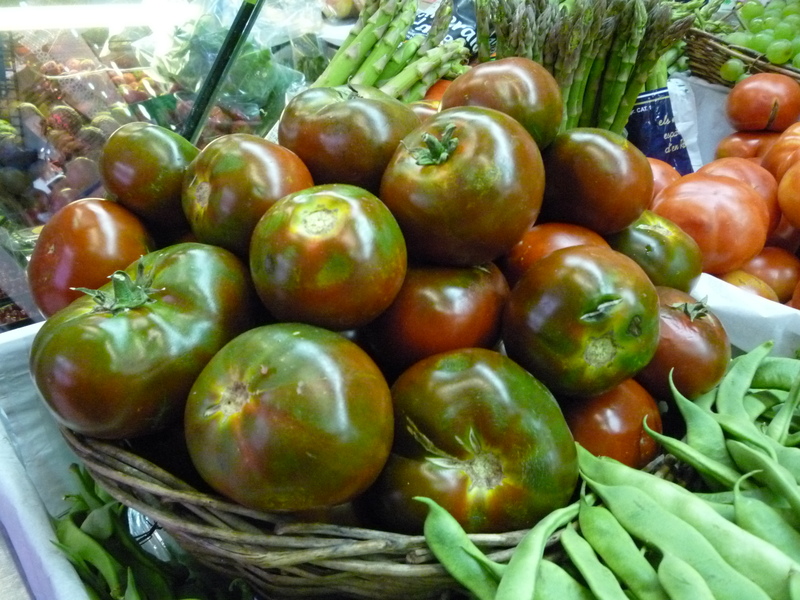 I'd like to squeeze THOSE tomatoes! Merchandise was beautifully organized in painstakingly-artistic displays to best show off each product’s color, freshness, and/or quality. It even smelled nice! Like, really nice! Even in this guy’s section! Not only that, though. Gleaming physical attributes aside, everyone I interacted with was nice. Genuinely nice. Not a “let’s be nice to the tourists so they buy our stuff” nice. Just plain old nice! I was over the moon. When I observed Alicia bantering with the different vendors, some of whom she’d obviously done business with for years, I realized that the market wasn’t only a place to buy groceries, but also a place to create personal connections and relationships. I was already giddy with glee at my Reus market experience, but once I projected myself into the scene and imagined myself greeting each vendor and asking about their kids/parents/vacations/dogs, I felt as if the clouds had parted, a ray of light had shone down upon me from the heavens, and angel choirs had begun to sing. I decided I LOVED Reus. 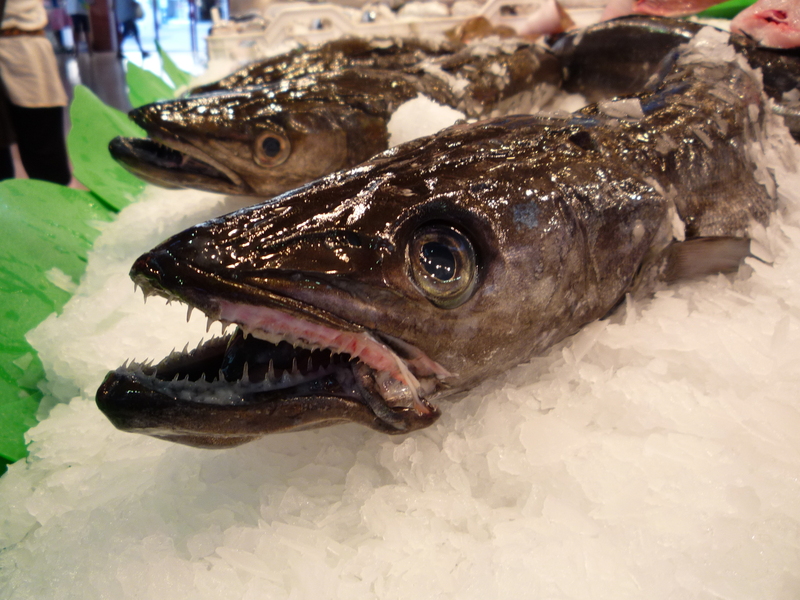 …and finally arrived at our next destination: a specialty seafood shop. To my utter shock, the tiny, glass-enclosed space didn’t even smell fishy, and was simply gorgeous. 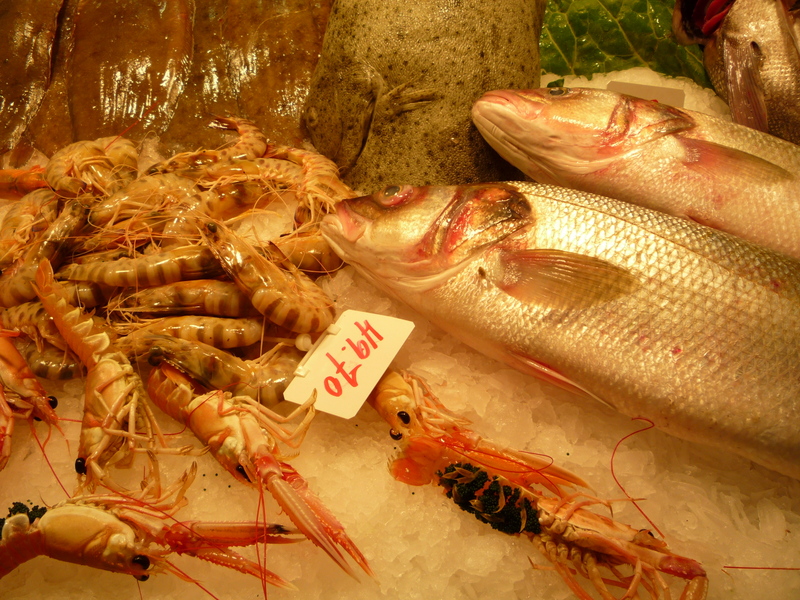 Here are some of the extra-fresh (many were even still wriggling around in the ice!!) yummies offered for sale—I don’t even know what most of them are, but I left the place feeling like I wanted to hug the shopkeeper and buy my fish there every week. We left the pescadería, and headed back outside. We admired the modernist architecture, and our hosts Alicia and Maite pointed out the markers in the sidewalk which indicate that a building is part of the Modernism Route in Reus. Following this Route, you can wander through the city center, walking from marker to marker, and see 26 of the city’s most famous modernist buildings. 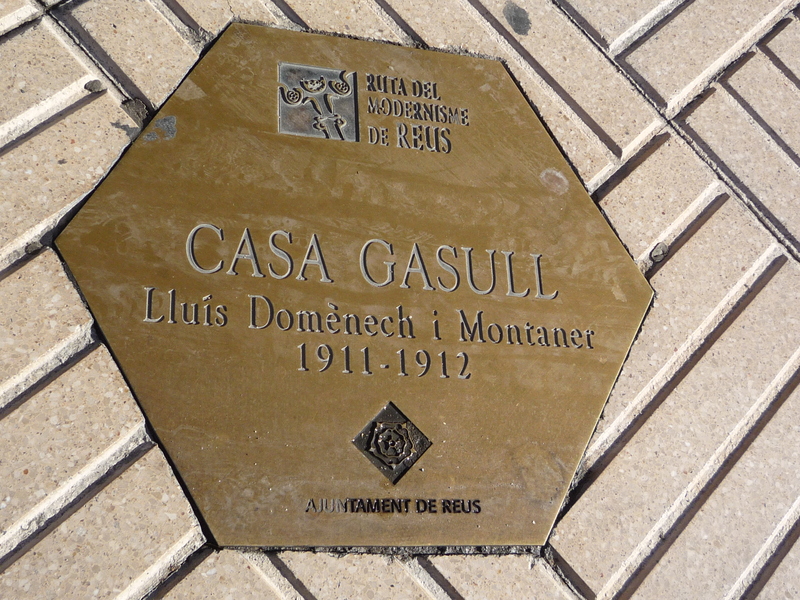 This particular marker was in front of this building, the Casa Gasull, designed by another famous Catalán architect, Lluís Domènech i Montaner. 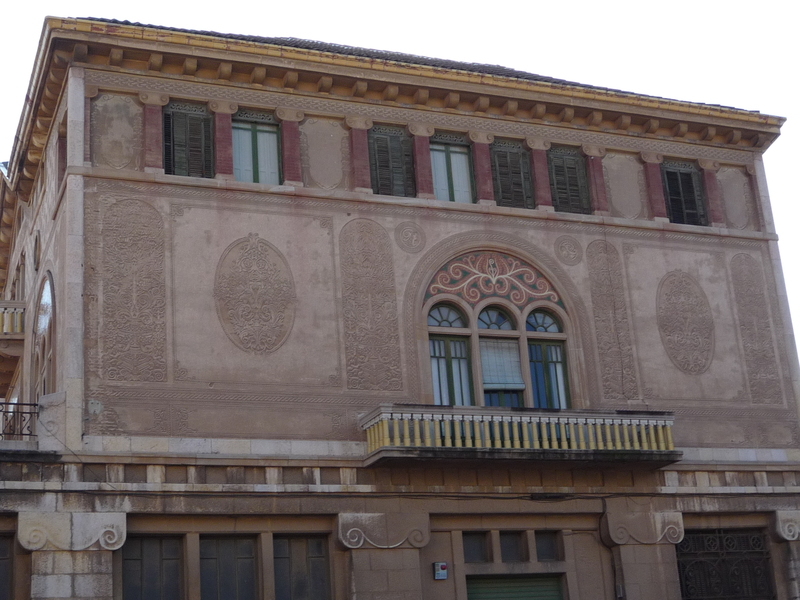 Across the way is another famous modernist building (also by Domènech i Montaner), the Casa Rull. 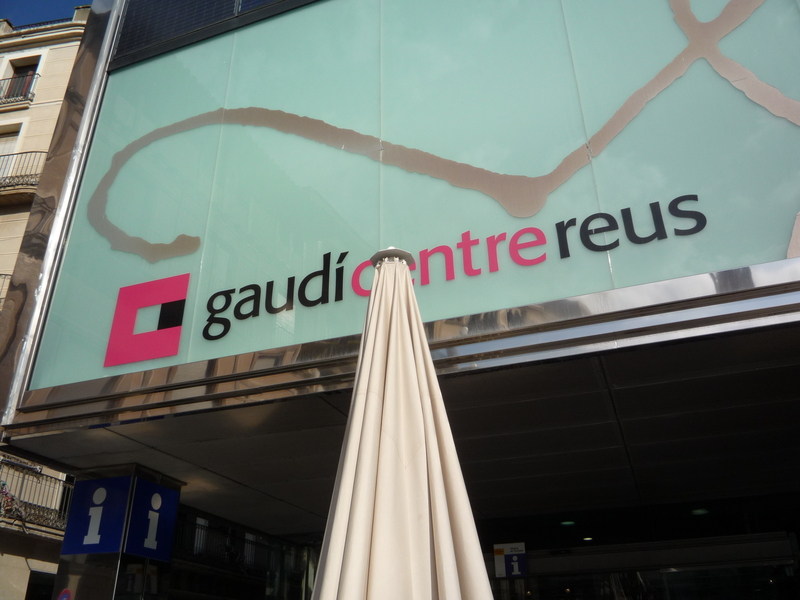 Shortly, we arrived at our next stop: the Gaudi Centre. I have to admit I was interested enough in Gaudí, but since I knew Fernando and I were planning to visit the Sagrada Familia in Barcelona once he arrived, I didn’t necessarily want to overdose on information pertaining to Modernist architecture or to Gaudí himself. Once again, though, I needn’t have worried – from the very welcome video at the start of the audiotour, I was hooked. I won’t be able to do justice to the experience, but I’ll try. We sat on swivel stools in a room with blank walls. 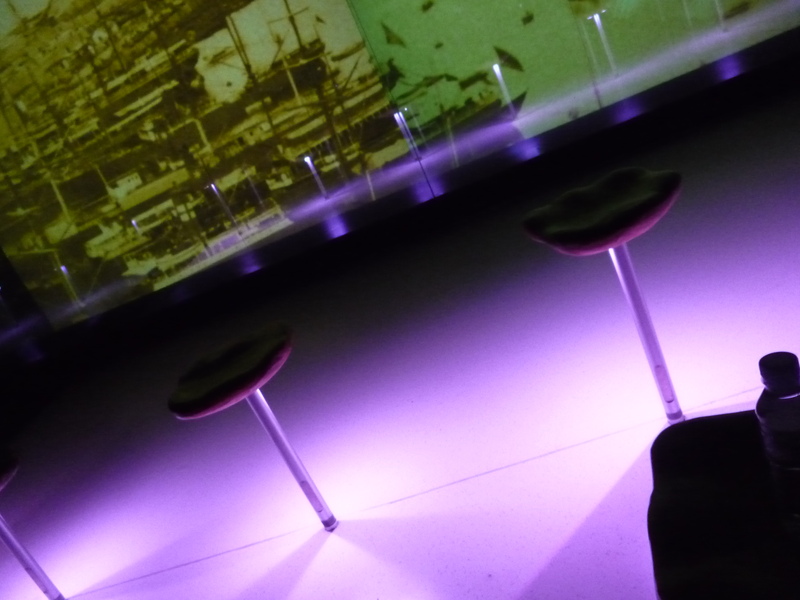 Three of the walls served as video screens, and as the images moved from screen to screen, you could just swivel your stool around to follow along. 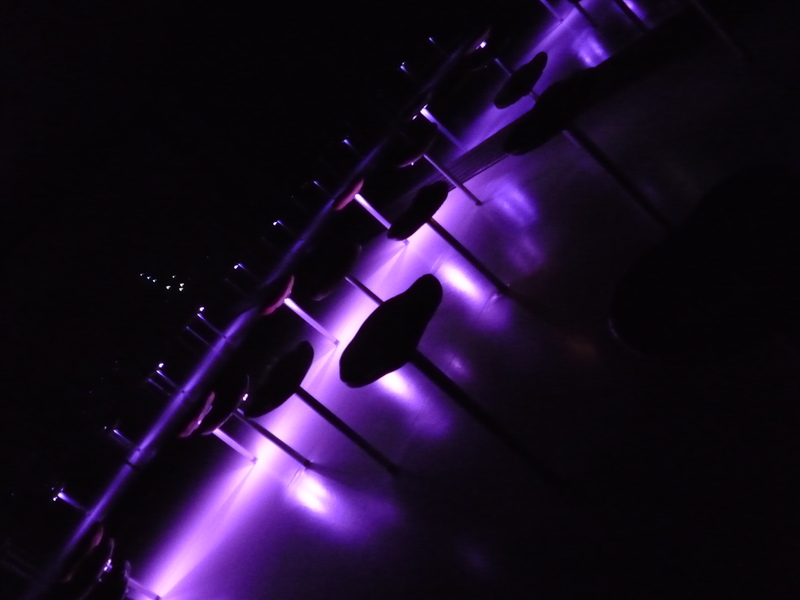 The super-cool part was that, as this transition from screen to screen (or wall to wall) occurred, colored lights illuminated downwards beneath the stools in a sequence to “move” across the floor towards the wall on which the images would be projected next. The effect was really neat, and at the end, the lights “moved” across to the back wall, where a secret hidden panel slid open to reveal the entrance to the museum. Whoa! 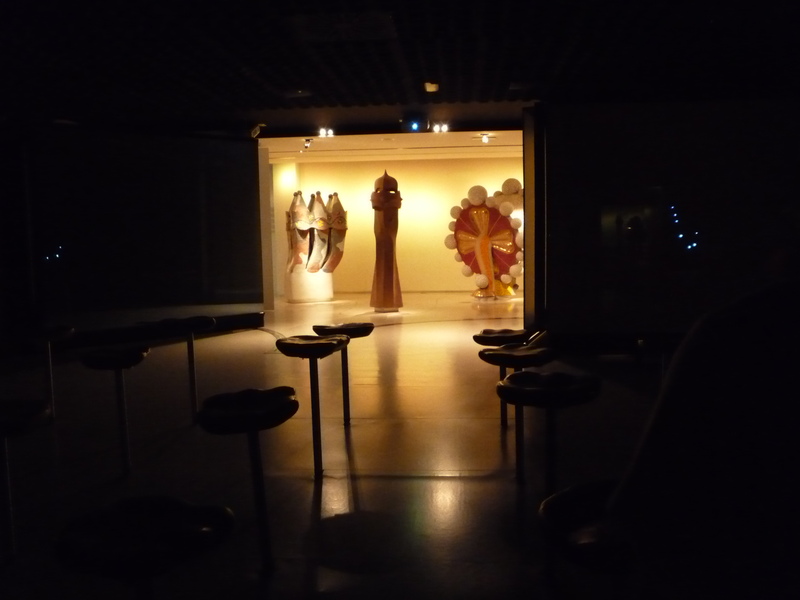 Here are a few images from inside the museum. I don’t know a thing about architecture, but any of you analytical types out there should check this stuff out – Gaudí really thought outside the box regarding how to design and calculate the details for the designs of his buildings, and it’s pretty heady stuff. 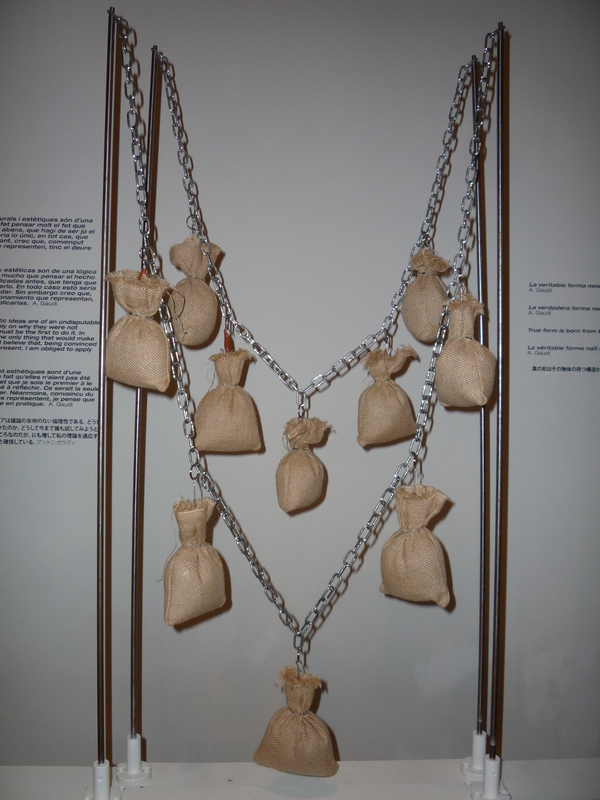 Gaudi calculated angles using small weighted bags hanging from cord or chain. Note how the same weight hanging from the shorter chain causes the support structure to bow inward. Same concept as above, extended version. 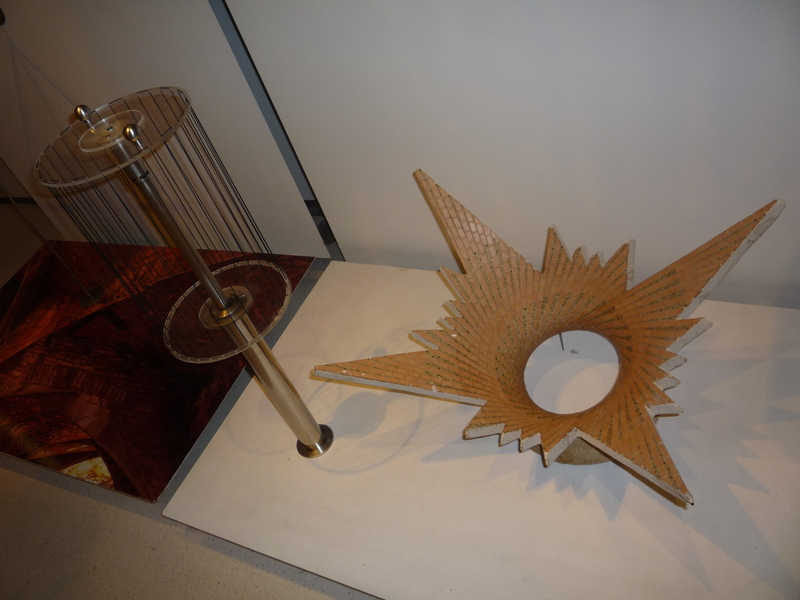 This was one of Gaudi's planning tools. The mirror displayed below allows this hanging structure to be seen as a solid structure, as supporting arches instead of hanging cords. The same photo as above, but upside down. You can easily see how this looks more like a solid structure. Neat, right? 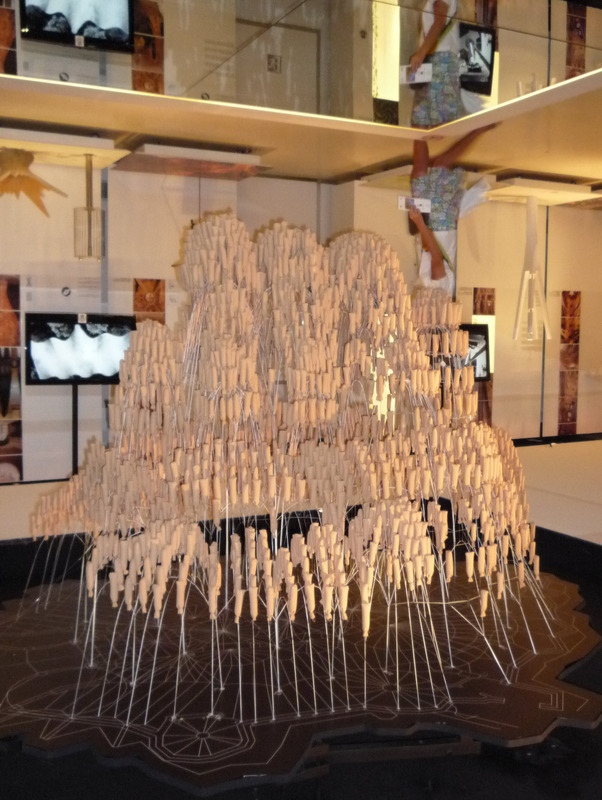 Model of a building next to the Sagrada Familia temple designed to have been a temporary school for the children of the workers who were constructing the temple. 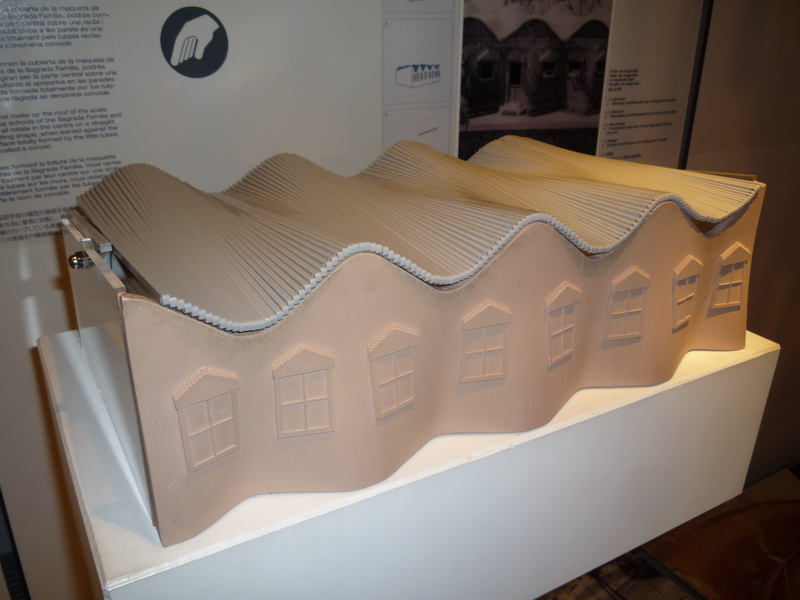 The "curved" roof is actually fabricated using a series of conoids - parallel straight pieces attached to a central axis on which each piece can rotate. 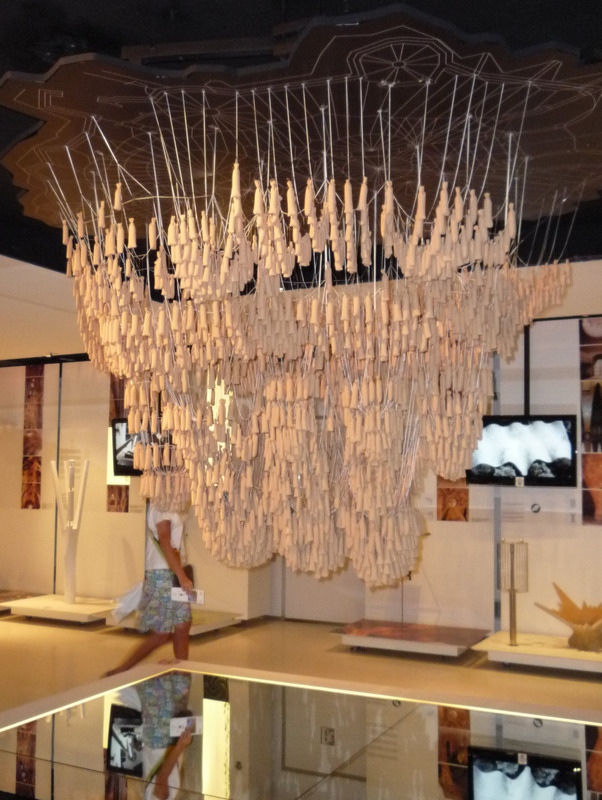 Gaudi created a curved surface using straight lines. The two round faces of the cylinder on the left are connected by a series of straight lines, here made of string. Rotating one of the disc faces on the central axis (the metal pole in the photo) creates an hourglass shape that is thinner in the middle and wider at the ends, much like the starburst-looking structure shown on the right. The straight lines remain straight, again allowing a curved surface to be created from straight lines. 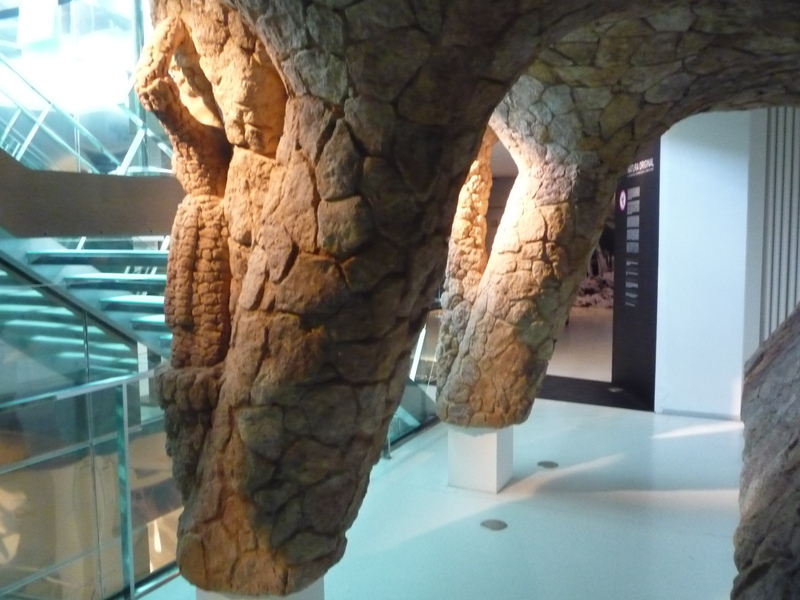 Gaudi fabricated structural columns like this. 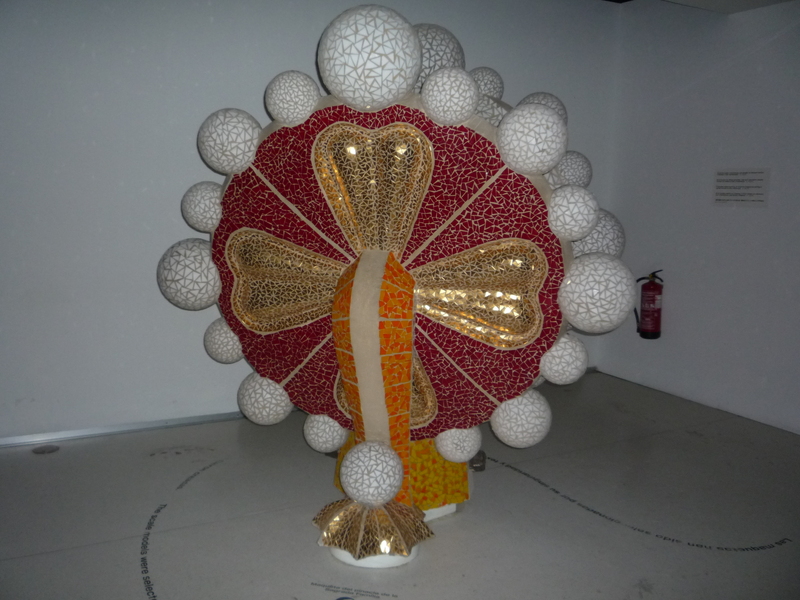 The visit to Gaudí Centre was very interesting, and I can’t wait to return to Reus with my dear F in tow to take him there. After our tour, Alicia and Maite picked us up and ushered us back out to the lovely streets for a bit of shopping, and then an early tapas lunch. I’ll tell you all about that in the next post! Thanks for following along!